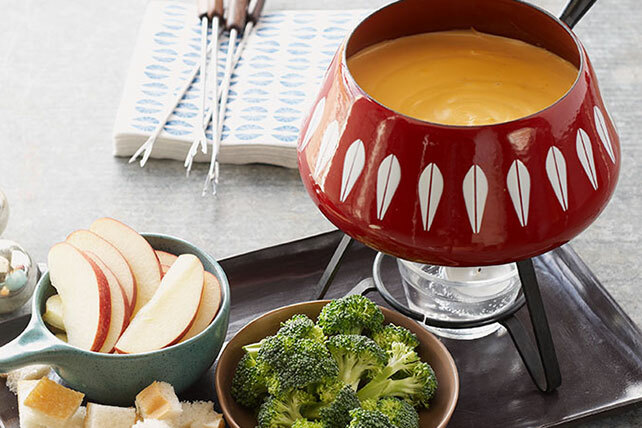 See how shredded cheddar and VELVEETA team up with white wine and dry mustard to make this creamy cheese fondue recipe a glorious dip. Combine cornstarch and mustard in medium saucepan. Add wine; whisk until completely dissolved. Add VELVEETA; cook on medium heat 5 min. or until VELVEETA is completely melted and mixture is well blended, stirring frequently. Add cheddar; cook and stir 2 to 3 min. or until melted. Substitute fat-free reduced-sodium chicken broth for the wine. Serve with sliced apples, broccoli florets and French bread cubes. Pour prepared fondue into fondue pot or small slow cooker set on low heat to keep warm while serving.